Sept 29 - ePartners Career Connection Event - 12 noon - 4:00 PM in EB2. This popular recruiting event for computer science students is offered exclusively to our ePartners. STARS Student Leadership Corps for 2008-2009 Announced! 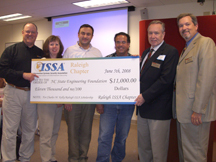 Fujitsu Transactions Solutions has donated $5,000 in support of the department’s Senior Design Center. Dr. Tao Xie, assistant professor, has received a Research Experience for Undergraduates (REU) supplement valued at $6,000 from the NSF to support his proposal "CT-ISG: Collaborative Research: A New Approach to Testing and Verification of Security Policies." The funds can be used to support an undergraduate student (US citizen only) who will be an active member in the research. Dr. Robert M. Kolbas has accepted a one-year appointment as the Interim Head of the department of Electrical and Computer Engineering effective July, 1, 2008. The intent will be to conduct a national search during 2008-09 for a permanent department head who will assume the position in fall 2009.